Tear down and repack in even less time! Our anti-fatigue tradeshow floor pays for itself in less than two shows. 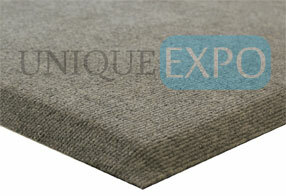 Available in a variety of colors and with a tapered edge, there is no better solution for your booth floor! Choose from 8 different color options! You can even mix colors to create unique patterns. As with any flooring product, exact shade matching cannot be guaranteed because of dif ferences between dye lots and/or fading due to the exposure to ultraviolet (UV) light, visible light and solar energy (heat). Not recommended for outdoor installation.